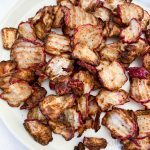 These tasty radish chips are easy to make in the air fryer and are great as a side dish or a savory snack on their own! Wash and pat dry radish slices. Place radishes in air fryer basket and spread out evenly. Spritz 3-4 times with oil. Sprinkle with salt, pepper, garlic powder, and onion powder. Cook in air fryer for 5 minutes at 370°. Give them a little stir and cook another 5 minutes. Spritz 3-4 more times with oil after 10 minutes and sprinkle with a little more salt, pepper, garlic powder, and onion powder. Cook another 5 minutes and give them another stir. Cook another 3 more minutes keeping a close eye that they don’t get too crispy.